Backed by local band An Dyskenn – with a blend of original and traditional songs in Cornish and English. Cornish pasties should be a ‘D’ shape and crimped on the side, never on top, says the Cornish Pasty Association The Cornish pasty has become a protected food following a long campaign to prevent it being copied by imitators. Only pasties prepared in Cornwall and following the traditional recipe can now be described as Cornish after the European commission awarded the dish “protected geographical indication” (PGI) status. 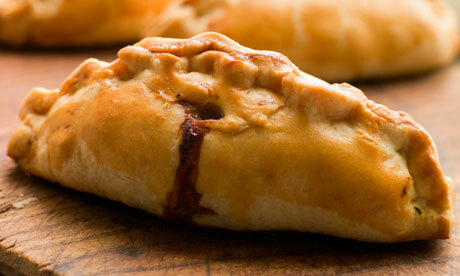 Authentic pasties can still be finally baked elsewhere in Britain. Campaigners celebrated the decision, saying it was important for the local economy – thousands of jobs are involved in the pasty industry – as well as for consumers. The announcement does not stop other producers from making other type of pasties but they won’t be able to sell them as ‘Cornish'”. The association said a genuine Cornish pasty had a distinctive “D” shape and was crimped on one side, never on top. The PGI is one of three European designations used to protect local foods, such as Gorgonzola, Parmesan-Reggiano cheese and Champagne. There are 42 other British protected products including Cornish clotted cream, Melton Mowbray pork pies and Arbroath smokies. Passionate patriot’s book is a cracking yarn full of originality and enthusiasm (c) Donald R Rawe 2010, 399 pages. — To claim that Donald Rawe is an ardent Cornishman would be a gross understatement. An articulate, passionate patriot and bard, he is Padstow to many and Lodenek to most. His bardic name gives another spelling Scryfer Lanwednoc (Writer of Padstow), so take your choice. With mariners on both sides of the Rawe family, he has knowledge and experience of many aspects of his Spargo’s Confession story. — A cracking yarn, full of originality and the enthusiasm that readers associate with him, it tells of the Reverend James Spargo, who takes up his pen “to confess his past misdeeds and unlawful exploits”. — Today we have a sneaking Cornish regard for those who bring back the baccy and the grog from continental holidays because, in a small way, it smacks of our heritage. — This story is set between 1810 and 1822, when smuggling was not only a way of life but a necessity. As a lad, Spargo heard the vicar thunder against “free trading” and declare that this would sink the culprit “into the mire of dishonesty and immorality that will surely damn him”. Yet his skilled mariner father said moral considerations were all very fine for those who could afford them – but life in Cornwall was very hard. His Irish mother was even firmer, who accused the Reverend of wanting to “take the bread out of the mouths of half starvin’ children”.What a dilemma for the boy. — The author brings in a large slice of local history in the remarkable stories of the Rowlands, local nouveau riche merchants who over-reached themselves, and of the Devereaux, genuine gentry. All Cornish life is here. The author traces social history with his stirring story of the hard times facing the local tenant farmers, of the huge chasm between rich and poor, of celebrations at the ‘big house’ and crisis times galore. — He writes of the exciting illegal years of contraband. — Cornish at home and Cousin Jacks abroad will delight in this historic drama, filled with colour and the salty flavour of the sea, as well as the class divisions of local life. The anniversary of the The Charter of Pardon 1508. Five hundred and one years agoKing Henry VII of England granted the tinners of Kernow (Cornwall) a pardon for which they paid the sum of £1000.